Talisman Energy has retained the Royal Bank of Canada to determine if buyers are interested in the company's Eagle Ford acreage. Talisman previously announced plans to divest $2-3 billion in non-core assets. The Eagle Ford is a core holding, but there are hopes the company could get as much as $2 billion for its 74,000 acres and 30,000 boe/d (2013 guidance). Talisman has already transferred operatorship of three rigs to Statoil, so the company's operations are smaller today. Statoil will operate half of the JV's acreage once they get to full scale. 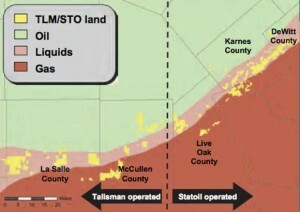 Talisman and Statoil agreed to an Eagle Ford JV in 2010. The most logical buyer is Statoil, but we'll have to wait to see if the company has the confidence in the area to pay a premium for complimentary acreage.